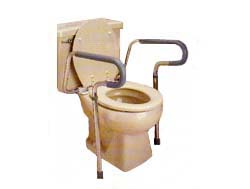 Bathroom Safety Products, Bedroom Safety Products and Mobility Safety Products. Scroll down to see our selection of Safety Products and Equipment for sale. Safety products are devices used to reduce injury to care givers and patients. We carry a large selection of safety products including anti scold and anti slip safety products, grab bars, step stools, safety belts and straps, physical therapy safety products, water floats, anti tippers and anti roll back devices for wheelchairs. Safety products are any item manufactured to ensure safety and protect against potentially harmful injury to a patient or staff member. Safety Products are also known as, safety equipment, safety supplies, and personal protective equipment because these terms more specifically define safety products. Safety products take the strain off care givers and the ones they care for. Whether in the facility or your home, the proper safety products will give you peace of mind..